Proud Nordic craftsmanship. Easy to prepare. Tastes like regular pasta. Natural.Pastella Protein fettuccine pasta is made of regular fresh pasta with protein from peas added. For supper we recommend Pastella Protein fettuccine pasta as main ingredient in delicious meatless dishes. Serve the pasta with vegetables, and you will have a lovely and tasty meal. 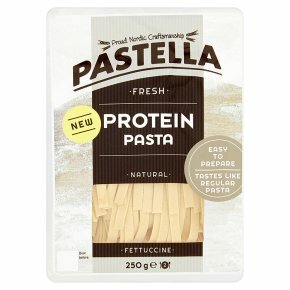 Thus Pastella Protein pasta can help you reduce your daily intake of meat.